If you are like most people, you like results fast. When you begin a network marketing business, the fact you like fast results does not change. So how can you build your network marketing business quickly, and begin seeing results? Well that’s exactly what we will dive into today, and you may not like the way that is the fastest, but most likely expect it. So let’s see what it takes to build a network marketing business quickly, and what we can do to keep us from having to do the “tough stuff” forever. 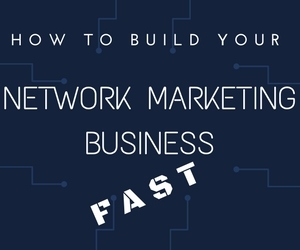 To break down and explain the fastest way to build a network marketing business, you must first understand the 2 options you have to build with. These 2 options are “active” and “passive” marketing. Active prospecting is where you actually speak to a person or a named individual who you know, or perhaps you actually just prospect. Active prospecting is where you actually speak to someone, answer questions, and “get to know” in person or over the phone. Passive marketing is like this blog post I’ve written. You put a piece of content, an ad, or a funnel in hopes that someone you do not know of will respond. So understand the difference between these 2 will help you to see how to build a network marketing business fast. For someone with no authority, someone who is new, passive marketing will not be very effective at first. It is important to actively prospect, get to know people, and find those who share the interest in this industry like yourself. Active prospecting is the fastest way to get results, period. When you prove to a person you are real, and they can contact you at anytime they wish, the risk in joining or buying is lowered. This is the power of active marketing and prospecting. It builds the “trust factor” into a person much faster than passive marketing would. However, active prospecting is mostly avoided by network marketers. Most people in network marketing hope to be able to just post pictures on social media and have people asking to join. The reality is, that doesn’t work, or doesn’t work well for someone who has no authority or is new to the industry. By active prospecting, you are able to build a team and get the authority you need. So you can’t ignore or try to skip this first step if you ever plan to get passive marketing to work for you. Should I Ignore Passive Marketing? In no way do I mean you need to ignore the passive marketing strategies. I have made several signups into my primary business, and countless other affiliate commissions from passive marketing. However, even with passive marketing strategies, turning leads into warm market increases the results. What I mean by this, is I still would need to contact my leads and work them as active prospecting. This is the fastest way to build a network marketing business. I actually recommend you use passive marketing strategies from day one of your network marketing business. But do not expect major outcomes at first. You should have your majority of time focused on contacting new people and active prospecting, and a smaller part of your time focused on getting leads (with the intentions of calling them). Doing your passive marketing in the late hours of the day is best, so you can spend more time on active prospecting during normal business and evening hours. How Can I Find Prospects To Talk To? One of the biggest challenges for new network marketers is finding prospects to speak to about their business. But, now the challenge of finding the right people to talk to, has been handled for you. All you need to do, is talk to them. Ryan Gunness created a marketing system for our industry that solves the problem of not having prospects to speak with. In his system “MLM Recruit On Demand” you can have the ability to speak to as many other network marketers as you wish, with no extra cost. This is something serious to consider, since it saves network marketers time in searching for good prospects, and money to invest in buying leads over and over again. The system gives you genealogy leads, which are the most powerful and highest converting type of lead for our network marketing industry. The reason I’ve found these to be best, are because you are only speaking to people who understand, and most likely enjoy the industry. Preventing the negative minded people who think everything is a scam, and only speaking to people who are most likely open to joining a network marketing business. You can learn more, and even purchase this system for a little investment of just $15. This will solve the problem of not having prospects for active marketing, and will keep you pumping people through your pipeline and eventually create an avalanche of signups. Since one day we would like to have people coming to us asking to join our business, we need a way for those people to find us. This is where passive marketing can help, and as your success using active marketing and prospecting increases, your response from the passive marketing will also increase. Like mentioned earlier, the fastest way to build a network marketing team is to simply go straight to talking to people. In the late night hours, or early morning hours you are not able to make calls most likely, so this is the time to build passive strategies. These are some of the most used, and effective passive marketing strategies. The idea is to pick one at a time, learn it, and continue using it on a consistent basis. Trying to work them all at once will cause overwhelm and neglect to them all. So let your business build with these strategies before adding new ones on to it. The fastest way to build a network marketing business would be to have these strategies in place generating you leads, while actively prospecting new people. You will find the more a person knows you, and the more they know about you, the higher the chance they will purchase from you. Hint, the idea of passive marketing is not to make a direct sale with no communication (although it will happen), the idea is to use passive marketing to find those who you need to build a relationship with. How Can I Implement Passive Marketing? The fastest way to implement passive marketing strategies would be to learn from those who have mastered each strategy. Since most marketers release educational products and training on one specific strategy, becoming part of a top earner community is wise. “My Lead System Pro” is a community and system for people who are in network marketing and want to build their business online. Covering every strategy online, and providing thousands of hours on every topic you could need to be successful in the network marketing industry. The system also offers tools all in one place to keep the costs of investment at the lowest possible price. Providing blogs with WordPress, funnels you can customize, and the experts to show you how to use them, it is no wonder they have developed more top earners than anyone else. You can check out “My Lead System Pro” below and test drive the system, and begin generating your own leads to turn into customers and business partners. So now you know how every top earner has built their network marketing business. Remember success loves speed, so active prospecting is a must to get your business moving quickly. I realize very few people want to have to call prospects and do the relationship building work, but you have to in order to build fast. This is the direct way of building trust with customers, one person at a time. As your success grows, your passive marketing strategies become stronger, and over time there will be more of your content floating around online. Best of luck, and work hard! If you want to build a network marketing fast, be sure to grab your free gift here on my blog of “20 ways to get leads” and private invites to mastermind training webinars with top earners and experts! 6 replies to "The Fastest Way To Build A Network Marketing Business"
Thanks for this incredible post, Jaye. Your insights into marketing are amazing, and the fact that you are willing to teach others is awesome. I am going to copy this for myself and use it for reference, and to be able to digest it over more than one sitting. Thanks again, Jaye. I will be sending some friends here to see this! Thanks Randy, I appreciate the feedback! I agree with Randy Jaye, your content is Awesome! I’ve learned a lot following you some things I haven’t seen anywhere else. You gave a detailed description between Active and Passive marketing. Also the best times to do both. I’m not finished with this PR, it’s not just a read but a Study. Thank you Robin, I am glad you came by! Thanks Todd, glad it was useful for you.